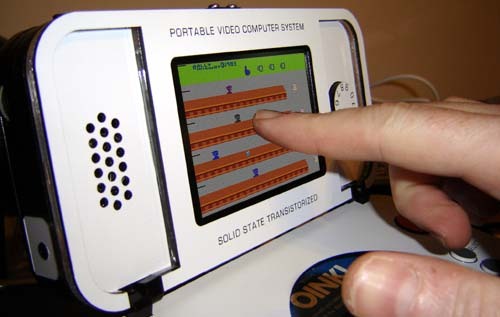 I’ve been slowly making new models of my VCS portables since 2000. Granted, most of them appeared in 2001, specifically revisions 2-5, but every so often something new comes along. 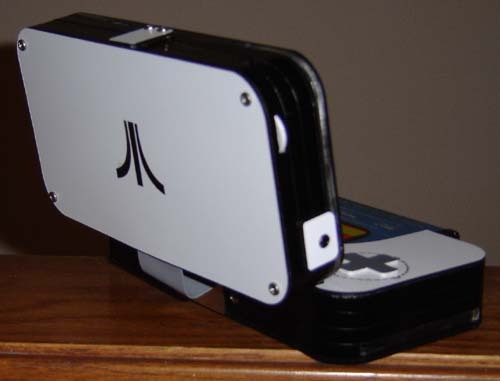 For this strange and unique Atari portable I decided to slap a 7 on it. Why not? I had a concept of a folding screen portable long ago, back in 2001 if I remember correctly. 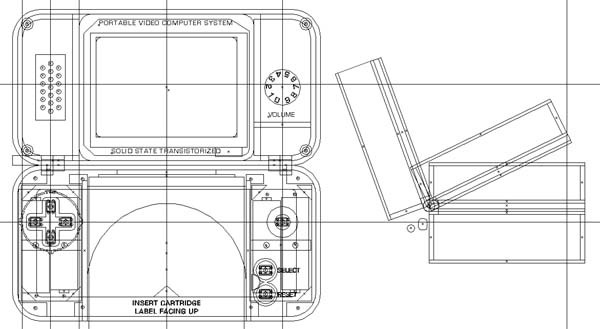 (Sorry folks, Nintendo didn’t invent the hinge along with the DS) Above is a sketch I did on a PDA (and still have in my Outlook notes) Originally it was going to have fold-up “joystick handles” with a D-pad on the left and a trigger on the right. 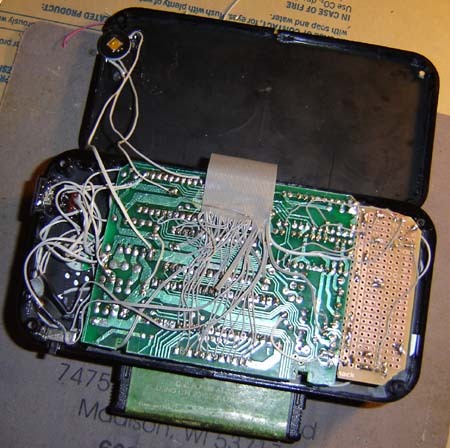 Cut to 2006 and I get the urge to build one again, for a person wanting an Atari portable. Next came the design. 2006 will go down for me as the “Year of Hinges” Originally I wanted to make this thing look very old, using wood grain, the color yellow and silver knobs. 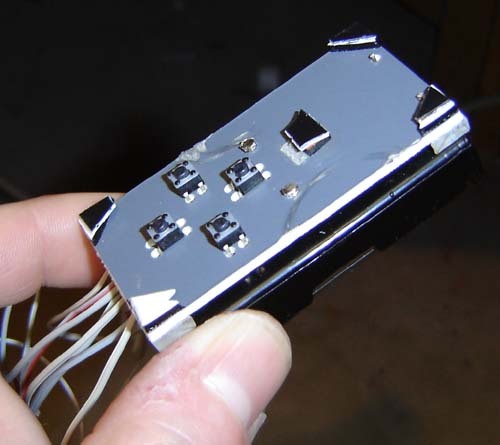 Spent a few hours browsing online TV museums looking for 1970’s era inspiration (though I’m typically more interested in the post World War I mechanical television) Finally I said “screw it” and made this thing white like every other piece of electronics these days. But I did slap on some text reading “Solid State Transistorized” since I am old enough to remember when things actually advertised that. Aesthetics aside, I did have some trouble positioning everything and keeping it small. 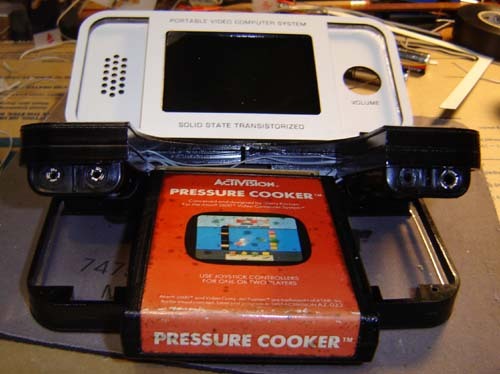 The d-pad and trigger had to fit inside the upper portion when closed, the cartridge of course takes up way to much space and there still had to be room for (4) AA batteries and an auxiliary power port. I came up with the idea of having the Atari guts themselves in the lid along with the 3.5″ LCD screen and audio controls. 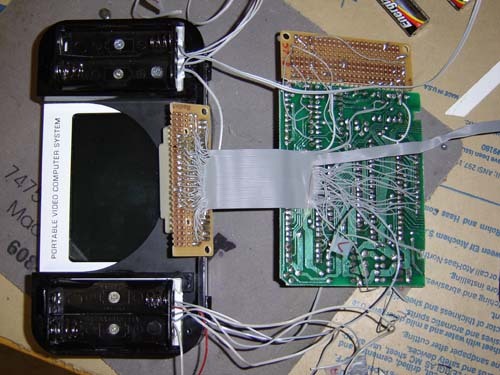 The ribbon cable would connect the two halves for not just the cartridge, but also power and game controls. Below is shown a control module. It has the tact switches and one of the battery packs. 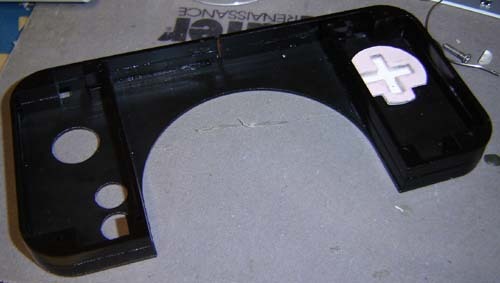 This next photo shows how the rebuilt cartridge slot fits into the base of the unit. 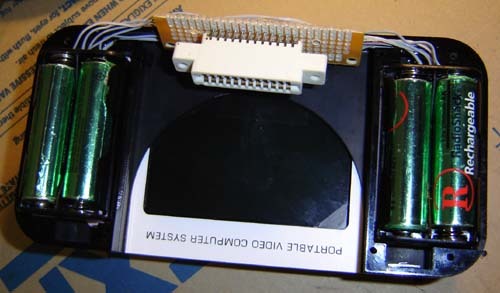 Since the older Atari cartridges had little “doors” that have to be pushed open with tabs, I used 2″ long screws to both hold the cartridge connector in place and poke open the doors. Another view of this, with the main Atari board tucked below. Top of the unit before the lid is screwed on. The thing in the upper left is a tint control knob. This unit also has a headphone jack along with an amplified internal speaker. Here’s an end view before the 2 pieces of the base were screwed together. 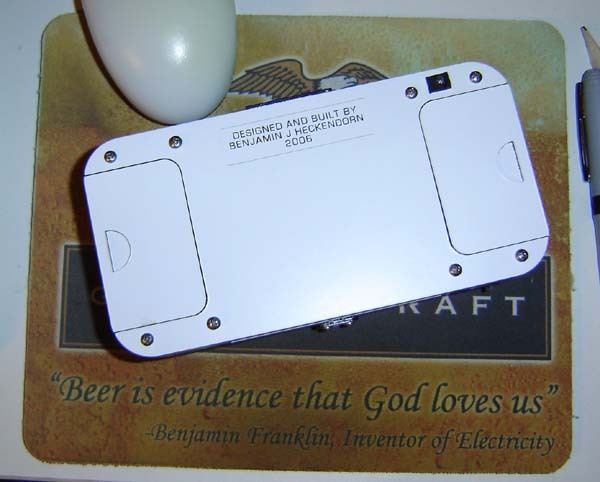 I designed the case in such a way that little doors slide over the batteries. The battery holders keep them in place just fine, but it looks better to hide them. The back of the unit, sitting on my favorite mousepad. The unit from the back, opened. Looking down the cartridge slot hole. Continuing a time honored tradition of this site it’s time to pit my VCSp Rev 7 against the fairly new Nintendo DS Lite. FIGHT! 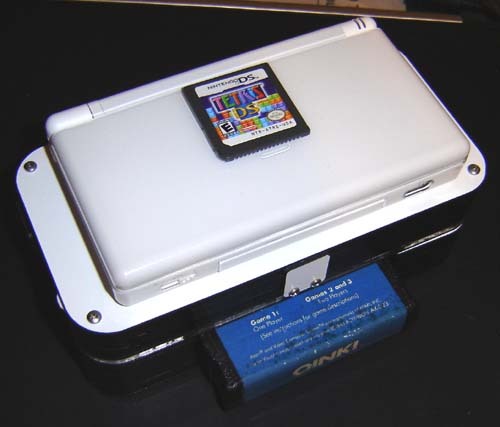 The DS Lite on top of the Rev 7. 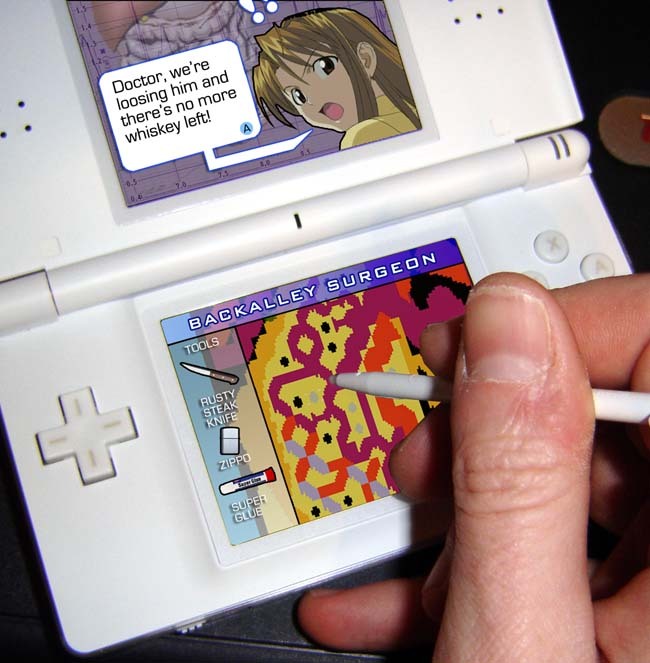 Having small cartridges really helps the DS. 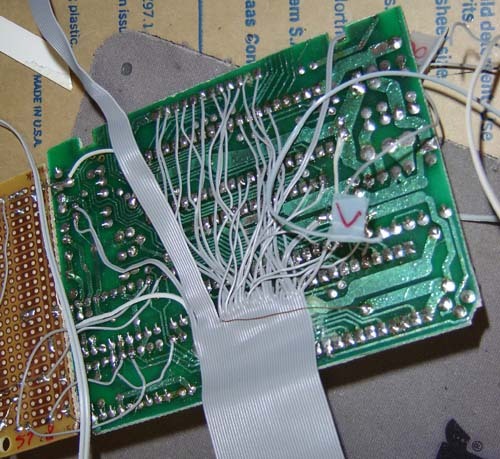 In this manner the DS clobbers my Rev 7 hands-down. With an Atari you’re stuck with large cartridges, while the DS uses ones barely larger than a camera’s SD card. Oh well. Touching the screen had no effect during Tapper. I didn’t get around to testing all my games, but the outlook is grim. 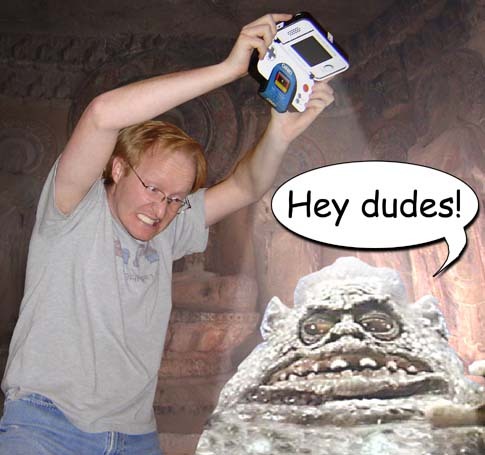 We all know the single best way to test a console is to take it into a cave and see what happens. This latest round of comparison was no different. Whew, that was close. Good thing I saw that guy coming. Clearly the DS, with its dual windows and wide-view beams, was worth “a fortune in precious stones” in a case like this. Whoah, look at this pile of crap. I woulda stepped into it had I not brought along my portable. Close one. So we can see that both game systems work fine when used in caves. There are the results – take them as you will and judge as you may! As for me, it’s back to the workbench to throw together the next project. Until then, happy modding!